I love me some animals! I do I do! And I love helping them too! That's why I decided to join up with Project Fur. This charity is a NO KILL organization, that helps animals lost in the horrible tragedy in Japan, that we are all too familiar with. The organization(s) helps to reunite lost pets with their families, give medical assistance and find new homes for those who cannot be reunited. 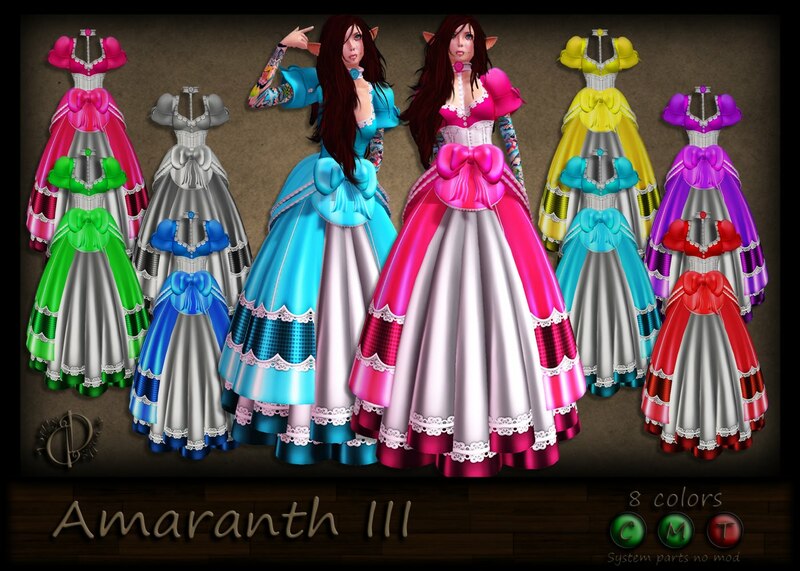 It's Amaranth III. Yup, third generation! This time its bright and BOOOOOOLD! This dress is currently exclusively available ONLY at Project Fur! It will be available in the main store afterwards though. But while at the event, 100% of the proceeds from this dress, as well as the rest of the items I have out, are being donated to Project Fur! I also gots new gachas! Spring is kinda here, and the summer is on it's way, so I kinda randomly decided to toss these together. The store group voted, and there are 3 gacha machines for these, so you have a better chance to get the ones you want. All gachas are transfer only, so you can swap with friends!